In dance, as in life, blending together with one’s partner in close connection while still being your own unique self with your personal expression, is a balance we aim to find. It’s a beautiful feeling when two bodies are moving as one, but this is often at the cost of one person completely giving into the other. It is also wonderful to dance alone, feeling free and self-sufficient, but it can also create loneliness. Dance is usually best when we are in a moment of balance, feeling the togetherness and connection with the partner but still having the freedom to express our individuality. When we both follow and resist, when we express ourselves while listening to others and when we have our own balance and can choose to lean against our partner, not because we need to, but because we want to. During these two days we are going to work on individual technique, expression and balance as well as on the connection between the dancers, using elements from Contact Improvisation and Tango. 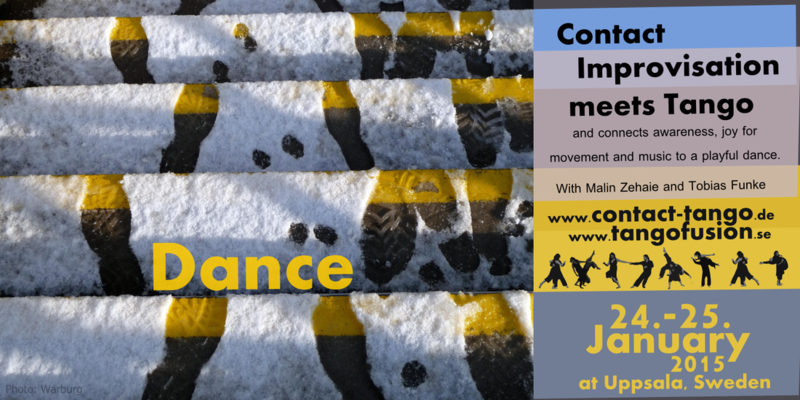 We are going to explore how to follow while still initiating new movements, and how to lead and be responsive at the same time. If the weather allows, we will also integrate nature and urban elements into a dance score outside, for those who like to join. For dancers of all kinds and levels. No previous experience of Tango or CI is needed. 15:00 – 17:00 Contact Tango Workshop and closing circle. Connected spirals and rotations in Tango. In this workshop we will examine and practice rotation in a holistic approach. The awareness and connection to all your and your partners body is an essential Tango basis. With this connection we will elaborate spiral movements and integrate gravitation. Once all elements are integrated into dance the quality of your Tango dance will change into more dynamic and flow. The class is made for medium to advanced Tango dance experience. Sleep: Uppsala offers a good choice of accommodation e.g. via AirBnB. We also help to connect you in order to find together as a group. Travel: The closest airport is Stockholm (ARN), check out Germanwings offers fairly cheap prices. Sat.-Sun. 600 SEK ca. 65 EUR, (Tango Fusion evening is included), one day Sat. or Sun. 450 SEK. The sunday lunch brake at restaurant is not included. Please ask for discount if you can not afford the workshop price. Please pay in cash right before the workshop. I come Sat. and Sun. only Sat. only Sun.